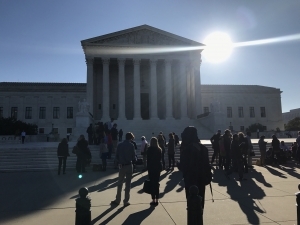 The U.S. Supreme Court will not review a lower court’s ruling that Rowan County commissioners violated the constitution by coercing members of the public to join in prayers advancing beliefs specific to one religion. The case had been rescheduled for conference 15 times before Justices decided to leave the lower court’s ruling in place. Justices Clarence Thomas and Neil Gorsuch dissented, and said they would have granted certiorari in the case. Between 2007 and 2013, more than 97 percent of the prayers delivered by Rowan County commissioners before public meetings were specifically Christian, according to the ACLU. The commissioners had instructed those present to stand and join in the prayer, leading many residents to feel coerced and pressured into doing so. In July 2017, the full U.S. Court of Appeals for the Fourth Circuit ruled 10-5 that the county’s practice was unconstitutional, upholding a lower court ruling in the initial case filed in March 2013. That lower federal court ordered commissioners to cease the practice of opening meetings with coercive, sectarian prayer, and requesting that the public join them in prayers that advanced one faith. Since then, a chaplain has continued to lead the commissioners in prayers not directed at the public. Daniel Mach, director of the ACLU Program on Freedom of Religion and Belief, said government officials don’t have boundless power to impose their religious beliefs on community members. “As the court of appeals recognized, there are real constitutional limits on government-sponsored prayer,” he added. You can read more about the dissents here. In a separate decision, Supreme Court Justices let some of the state legislative districts drawn by a special master stand in North Carolina’s long-battled racial gerrymandering case. Lawmakers have argued from the get-go that they never looked at race when drawing their remedial map in North Carolina v. Covington to correct racial gerrymanders. They argued as late as a couple days ago that their good faith in not considering race should be enough for the high court to throw out all the special master’s redrawn districts. The special master redrew nine of lawmakers’ 28 remedial districts — of those the Supreme Court is only letting four of those districts stand for the 2018 elections, as the other five involve state-constitutional issues. “The defendants’ insistence that the 2017 legislature did not look at racial data in drawing remedial districts does little to undermine the District Court’s conclusion — based on evidence concerning the shape and demographics of those districts — that the districts unconstitutionally sort voters on the basis of race,” the court’s per curiam order states. Allison Riggs, senior voting rights attorney for the Southern Coalition for Social Justice, who represents the plaintiffs in Covington, said voters in North Carolina will finally be able to vote in state legislative districts drawn without unconstitutional racial discrimination. Riggs also represents plaintiffs in a state court lawsuit over the districts in Wake and Mecklenburg that the special master drew but the Supreme Court didn’t allow. The claims in that case involve a state constitutional ban on mid-decade redistricting. “We’re certain the state courts will correct the state constitutional violations before the 2020 elections, as we already have the trial court in NAACP v. Lewis finding that we are likely to succeed on the merits, but importantly, we have finally achieved our clients’ goals for this litigation: to eradicate the blatantly unconstitutional sorting of voters by race in North Carolina’s state legislative districts,” she said. “Once the District Court had ensured that the racial gerrymanders at issue in this case were remedied, its proper role in North Carolina’s legislative districting process was at an end,” the order states. The special master’s districts that were upheld are: Senate districts 21 (Cumberland and Hoke counties) and 28 (Guilford) and House districts 21 (Duplin, Sampson, Wayne) and 57 (Guilford). You can read the full per curiam order from the Supreme Court here. I agree that lawmakers should not force their Christian religion on everyone. I agree that the special master redrawings should be honored. As far as the state constitution, the state legislators regularly violate their oath to uphold the constitution. Their actions should be based on the will of the people. Not what is best for their re-election. The state constitution says they have to act for the goodwill of ALL people, not just white republicans.